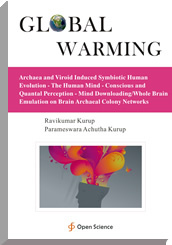 Global warming leads to increased endosymbiotic archaeal growth and secretion of RNA viroids which can form quasi-species consortia modulating brain function. The RNA viroidal quasi-species consortia is edited by archaeal digoxin generating new RNA viroids and new quasi-species consortia. These RNA viroidal quasi-species consortia contributes to states of mind. The archaeal magnetite in the setting of endogenous digoxin induced sodium potassium ATPase inhibition produces a pumped phonon system induced quantal perception. This archaeaons with quantal perception is capable of mind downloading and whole brain emulation which can last for eternity in time. The archaeaons and their RNA viroidal quasi-species consortia contribute to conscious and quantal perception.